The Queen’s passion for horses has been a lifelong affair. The young Princess Elizabeth first learnt to ride in the Royal Mews at Buckingham Palace and on her fourth birthday she was given a Shetland pony called Peggy by her grandfather King George V.
Apart from being a highly accomplished rider, the Queen has also bred and owned a succession of top racehorses. Lester Piggott rode her filly Carrozza to Oaks glory at Epsom in 1957, and three years ago she became the first reigning monarch to win the Gold Cup at Ascot with her thoroughbred Estimate. It is no surprise then that the Royal Windsor Horse Show is an unmissable event in Her Majesty’s diary. Held in the private grounds of Windsor Castle this week, the five-day show will also be the venue for her official 90th-birthday celebrations. 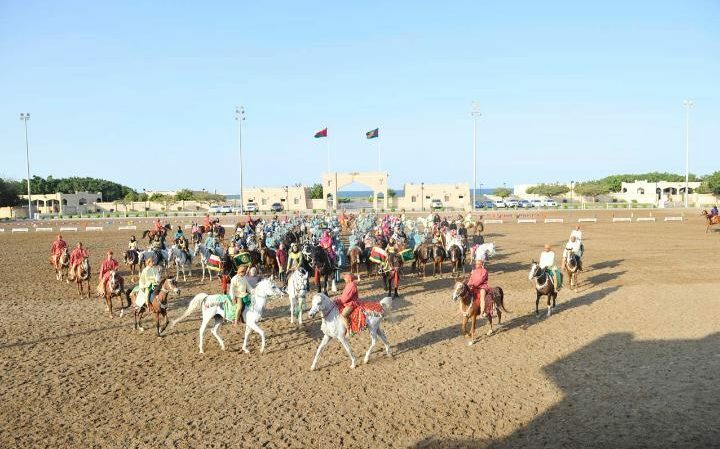 Among the 900 horses and 1,500 participants will be a cavalry unit from Oman. The event’s organiser, Simon Brooks-Ward, explained, ‘The Omanis performed in front of the Queen on a state visit there in 2010 and were extremely well received. For the last 10 months, Omani cavalry officers have been struggling to imagine a green field in the Home Counties as they prepare for the birthday celebrations. Temperatures in the Sultanate often hit 50C during the summer and rainfall is treated like a gift from heaven. Part of the cavalry’s base next to Al Safinat beach has been somewhat anglicised in recent months to mirror Windsor Park showground, over 3,500 miles away. Admittedly, the view from the replica royal grandstand faces the Indian Ocean. There’s also not a blade of grass in sight and palm trees double for English oaks. The horses are a well-groomed mix of mainly Arabs, Clydesdales and Shires. ‘The countries and acts for Windsor have been selected for their variety and ability to join in with the spirit of the event,’ said Brooks-Ward, who has organised many equestrian spectaculars for the Royal household, such as the Royal Tournament and the 2012 pageant. Included in the celebration programme with the Omanis are Chilean huasos, who will perform a synchronised dance routine with their horses; Canadian Mounted Police showing off their horsemanship, a troupe of dancers from Azerbaijan, and riders who perform acrobatics on Karabakh mountain horses. Over four nights they will combine with foot soldiers and marching orchestras from both Australia and New Zealand. The celebrated French horse whisperer Jean-François Pignon was also personally requested by the Queen to appear. The British military will be represented by the Queen’s mounted troops, marching alongside more than 100 pipers. A member of the Royal family will attend each evening, with Her Majesty watching the finale. For today’s 4pm rehearsal in Oman, though, Brigadier-General Abdulrazak al Sharwazi is looking anxious. With just three months to go before the event, the commander is making copious notes from high up in a grandstand, located exactly where the Queen will sit at Windsor. The routine involves 100 horses and a cast of 150 riders and musicians. ‘We can recreate the Windsor showground for our riders but we cannot teach the horses what to expect. In Oman they are not used to performing with the noises of a large crowd sitting so close – their role is ceremonial and takes place on large display grounds for royalty and state visits. ‘Just the murmur of talking or the clatter of a seat nearby can be disturbing. There is also the very real worry of cold weather. Their horses are transported in two specially modified Boeing 777 jets before they set up camp in Windsor Park for three weeks. Today, though, the rehearsal will be the focus of Sharwazi’s attention. His cavalry unit was established by Sultan Qaboos in 1974, initially with just 20 horses. The cavalry has grown to 140 horses and 200 riders, filling the vast Al Safinat stables. Most of the cavalry squadron are in their 20s and some performed at Windsor for the Queen’s Diamond Jubilee. The base was built in the mid-1980s and is part of the Royal Palace complex, some 15 miles north of the capital, Muscat. The Firqah ceremonial section of men and women was created in 1993 and is famous for brightly coloured displays of costumes and horsemanship. 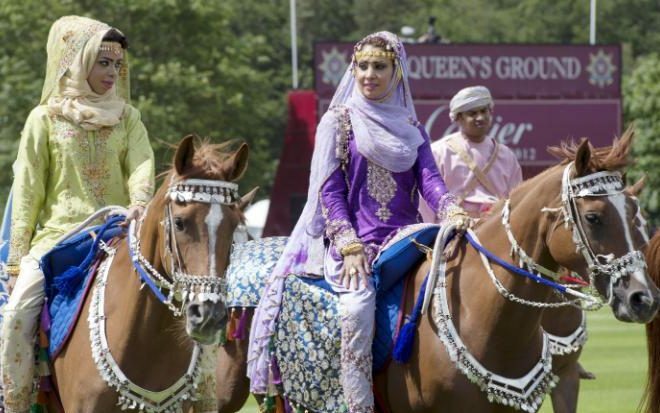 ‘There is no correlation between the costumes the riders will wear at Windsor and their tribal heritage,’ said Sharwazi. ‘The Sultan has always tried to avoid secular identification but very much encourages the notion of nationalism in the Firqah – bringing the country together. Although the brigadier is determined to keep the exact details of his Windsor programme under wraps, British audiences can expect a 15-minute display of breathtaking agility. Stunts include a 10-man pyramid on horseback, and a thunderous cavalry charge. The Arab horses they ride are one of the most easily recognised breeds, with a beautiful dished face, and tail carried proudly high. 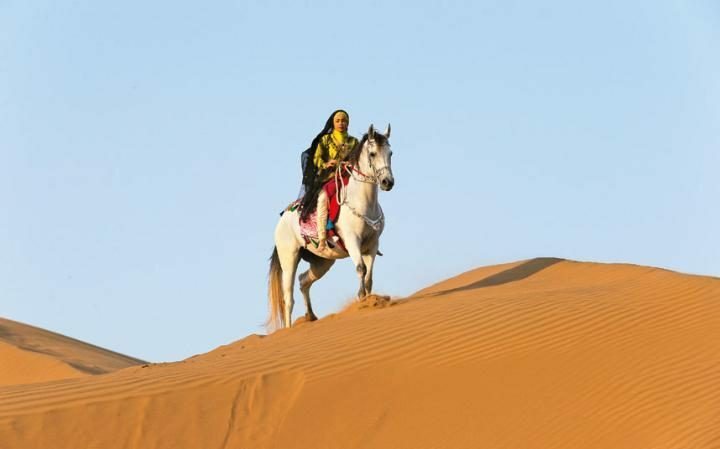 Women now make up 25 per cent of the Omani cavalry. In the Firqah, some of them are trained to stand upright on their saddles. Others perform the rakd al arda, or close- formation galloping in pairs. 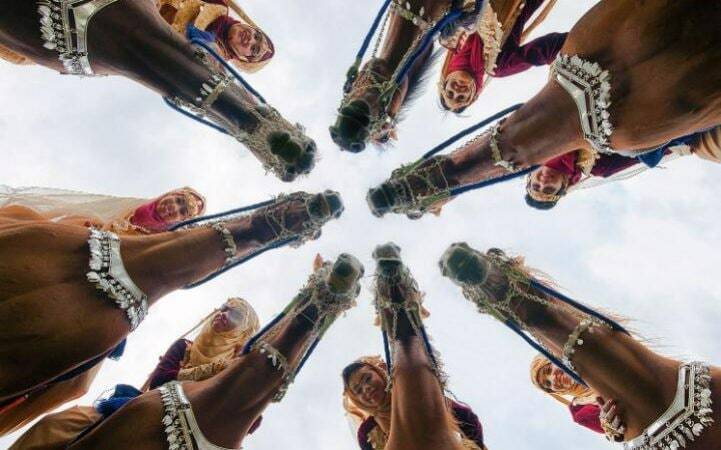 Their riding skills are enhanced by poems and chants, as well as the hairoob – in which the horse lies down and plays dead. ‘These are all traditional skills that we can trace back to our ancestors,’ explains Sharwazi. ‘They were used to fighting in the desert and we are helping to keep these traditions alive. The brigadier also believes his mounted female orchestra of 160 women is the only unit of its kind in the world. It formed in 2009 with musicians selected not only for their playing skills but also riding ability. They come to Al Safinat to perfect their musical techniques in a state-of-the-art facility that includes a recording studio. Then comes the difficult part – learning to guide a horse with only their knees, while playing an instrument at the same time. British cavalry officers have been drafted in to help for the Windsor event. Paul D’Arcy, a retired Corporal of Horse with the Household Cavalry, is a percussion specialist. During a long military career he has played at countless state engagements, including the wedding of the Duke and Duchess of Cambridge in 2011. ‘They make it look easy but years of training have gone into this,’ says D’Arcy, tightening a saddle drum before the orchestra horses enter the arena. Alongside him is retired major Douglas Robertson of the Scots Guards. Unusually, the Omanis will also take a full complement of 14 mounted bagpipers to Windsor. Sultan Qaboos has a penchant for the instrument from when he joined the British Army as a 20-year-old and trained at Sandhurst. The cavalry officers have also been trained to play while riding camels, and Sharwazi is keen to point out that the Sultan has a flock of racing ostriches in his collection, too – though, sadly, these will not be performing for the Queen. One of those returning to England for Windsor is Raida Albahri, 25, a member of the mounted orchestra. In the morning she rides out with the rest of the cavalry, then studies the flute in the afternoon. ‘My father bought me my first flute when I was a little girl. The colourful costumes worn by the women are based on traditional Omani clothing. In silk and cotton, they are specially made at the Al-Obaidani factory in Muscat. ‘We find them very comfortable – they are light and easy to ride in. 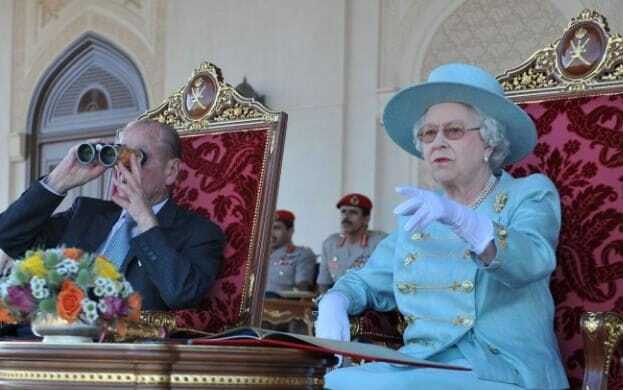 When we were introduced to the Queen in 2012, she was fascinated by them,’ said Albahri. The men also wear traditional riding clothes. Tarik al Haddabi, 29, joined the cavalry 10 years ago and says his only concern about travelling to England is the cold. The air-conditioned stables at Al Safinat are spotless. Each horse has a large loose box and is identified by a printed name tag that slots into the stable door. Bogama, Methaq and Maskirovka are among those travelling to London. 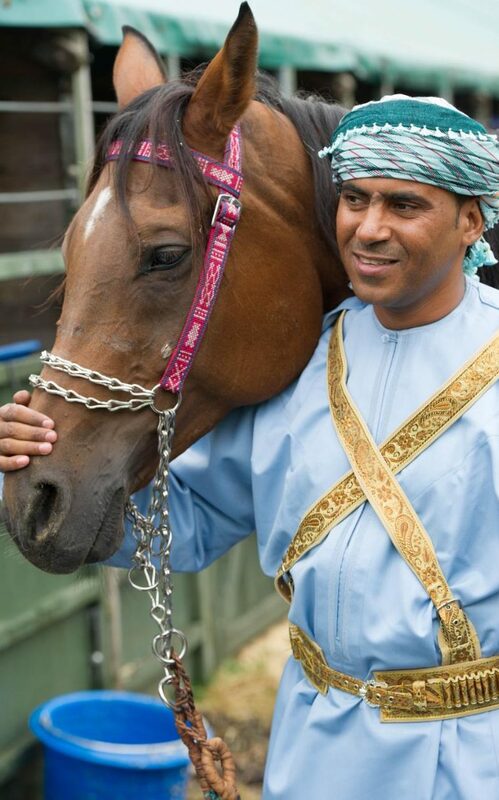 ‘Arabian horses are very slight, compared to English breeds,’ explains al Haddabi. ‘This makes them agile and fast but they will lose weight on the eight-hour flight to London. We have a special feeding programme to cope with this. ‘Give them too little and they lack energy – too much and they don’t want to perform. Everyone here is an expert, so we know exactly what to do. In the parade ground, the horses are beautifully turned out and, having started their day with a canter along the beach, they are ready to concentrate on the task ahead. Sharwazi takes his seat and nods for the rehearsal to start. Pipers lead the orchestra in, mounted on Arab horses, and close behind is a large wooden carriage containing the drummers, pulled by six Friesian horses. Against the desert backdrop it’s a mesmerising sight. While the soldiers look stunning in their costumes, it’s the horses that steal the show. Decked out in tassels and brightly coloured saddle clothes, their necks jingle with braids of silver that catch the afternoon sun. 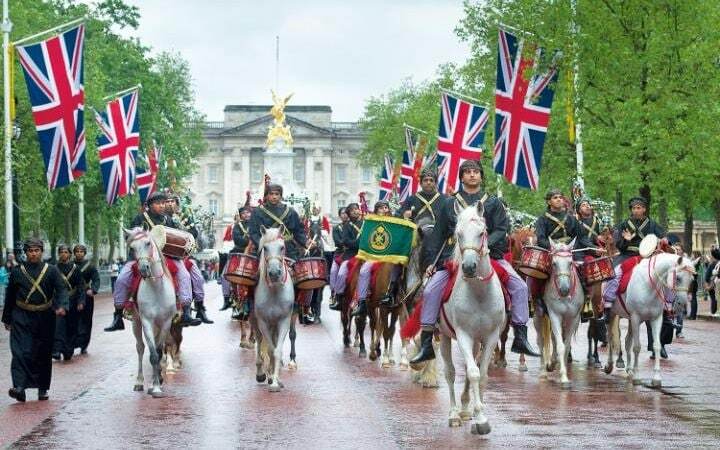 And while one Omani rider takes a tumble at the finish of a galloping stunt during rehearsal, it will take more than that to stop the cavalry at Windsor. His Majesty Sultan Qaboos bin Said, the Supreme Commander of the Armed Forces, on Wednesday presided over the parade, which was staged at the military parade ground in Hisn al Shumoukh on the occasion of the 45th National Day. Symbolic units representing the Sultan’s Armed Forces (SAF), the Royal Guard of Oman (RGO), the Sultan’s Special Force (SSF) and the ROP took part in the parade. Upon the arrival of His Majesty the Sultan to the parade ground, Gen Sultan bin Mohammed al Nuamani, Minister of the Royal Office, Sayyid Badr bin Saud bin Harib al Busaidi, Minister Responsible for Defence Affairs and Lt Gen Ahmed bin Harith al Nabhani, SAF Chief of Staff were honoured to receive His Majesty the Sultan. Upon His Majesty the Sultan’s ascension to the Royal Dais, the parade columns gave a military salute, the Royal Anthem was played by the joint military band while the artillery fired a 21-gun salute. The commander of the parade column then approached the Royal Dais asking permission from His Majesty the Sultan, the Supreme Commander of the Armed Forces to start the parade, which began with the joint military musical band that represents the corps of the SAF, RGO, ROP and Royal Court Affairs (RCA), which passed in military formation before the Royal Dais. Then, the columns of the Protocols Guard performed the parade accompanied with pieces of the joint military music, passing before the Royal Dais, giving the salute to His Majesty the Sultan. Then, the Royal Anthem was played and the Protocols Guard gave the salute to His Majesty the Sultan signaling the conclusion of the parade. His Majesty the Sultan then left the ground. His Majesty the Sultan received the gift of the Ministry of Defence and SAF from Sayyid Badr bin Saud bin Harib al Busaidi, Minister Responsible for Defence Affairs in the presence of the SAF Chief of Staff and SAF commanders. His Majesty the Sultan was accompanied during the parade by their highnesses, the chairmen of the State Council and Majlis A’Shura, ministers, advisors, commanders of SAF, RGO, SSF, ROP and the military and security apparatuses, members of the State Council and Majlis A’Shura, undersecretaries, governors, judges, Omani ambassadors, heads of diplomatic missions in Oman, walis, military attachés, senior military commanders and officers, senior officials of the state, sheikhs, dignitaries and a number of commissioned and non-commissioned officers and personnel of SAF, RGO, SSF, ROP, RCA and other security apparatuses. Salalah is attracting more visitors than ever, with more than 150,000 having visited the Dhofari capital to enjoy the khareef between June 21 and July 25, an increase of 171 per cent compared to the year before, according to the National Centre for Statistics and Information (NCSI). One of the reasons for the increase in tourists is that Ramadan ended earlier this year and many people visited Dhofar during the Eid holidays. But whatever the case, the high number of visitors has meant good business for hotels, museums, restaurants and other services. “We’ve had a very good July. Since the start of the khareef occupancy for our property was above 90 per cent,” said Daniel Fanselow, GM of Juweira Boutique Hotel at Salalah Beach. There have many people making last-minute bookings, and some booking into August, too, so Fanselow was optimistic that business would continue to be strong until the end of the khareef season. At the Crowne Plaza Resort business has also been strong this khareef season, said GM Manuel Levonian.“There’s been a steady occupancy since the beginning of the season. We’ve been doing an occupancy of about 85 to 90 per cent on an average,” he said. The Eid holidays were especially busy, he added, with some days hitting 100 per cent occupancy. Now the huge rush is over but business is very steady, and the city and region are filled with tourists enjoying the mild temperatures and misty mountains. “The atmosphere is vibrant and the city is very busy. The roads are very busy and obviously a lot of people are in the mountains, which are quite green,” added Fanselow. Statistics compiled by the NCSI also indicate that the highest growth in the number of visitors was recorded among those from Asian countries who logged a whopping 248.4 per cent surge during the period with their numbers touching 28,370. Of the total 150,334 people who arrived in Salalah since the khareef season began, as many as 115,789 were from GCC countries including 89,523 from the Sultanate, showing a rise of 164.6 per cent compared to the figures recorded during the same period last year. A further 13,219 GCC visitors to Salalah came via regional flights, while 4382 people flew in on international flights. There has been a significant increase — 102.8 per cent to be exact — in the number of khareef visitors from other Arab countries, too. Their numbers reached 4568, of which 1668 visitors came through Salalah airport. A total of 4655 visitors from Asia arrived in Salalah via the airport. The magic khareef has even cast its spell among Americans, with 351 people from the USA visiting Salalah during the period, posting a growth of 36.6 per cent compared to 2014. More than twice the usual number of visitors have stopped by the Al Baleed Archaeological Park and Museum of the Land of Frankincense this season, too, said Ghanim Al Shanfari, Director of the Museum. “This July we had 22,084 visitors. In the same month of the last year we had 10,560 visitors,” he noted, adding that the Samahram Archaeological Site had 9929 visitors this July, up 8.4 per cent from 9162 in July 2014. Over the past year there have been renovations and new services at the Al Baleed site, including a cafe and botanical gardens, which have attracted more people, he explained. To cope with the increase in numbers the site has hired more museum guides, increased the security, and lengthened the opening hours from 9am to 9pm from Sunday to Thursday and 3pm to 9pm on Friday and Saturday. “In general, to be honest Salalah has really become an international tourist spot. Last year there was really a big number of European tourists, too,” said Al Shanfari, adding that he expected many visitors from countries such as Germany, Switzerland and France from the beginning of September. Fuel stations are also making sure they are well stocked and able to provide for all the extra vehicles on the roads. Omanoil, for example, is constantly monitoring its reserves at all its 17 fuelling stations in Dhofar as well as those located in route, as well as continuously replenishing them to avoid any possibility of a shortage. In addition, all Ahlain stores have been fully stocked with a wide array of products and goods for the convenience of its shoppers. “Our extensive retail network has been fully prepared to meet the challenges posed by the huge volume of tourists. In fact, officials have already recorded a 77.3 per cent rise in the number of visitors to Salalah compared to the same period last year. It was therefore essential for us to develop an approach that would ensure all customers continue to enjoy the quick and convenient experience the Omanoil brand is renowned for 24 hours a day,” said Faisal Al Shanfari, Oman Oil Marketing Company’s General Manager of Human Resources, Corporate Affairs, Procurement and Health, Safety, Security and Environment. The flow of visitors is expected to stay strong through the end of khareef and even into the Eid Al Adha holiday, which is expected around September 23. Levonion said the Crowne Plaza Resort is already taking bookings for the next holidays. “We are already seeing a positive trend for the next Eid holiday,” he concluded. Be it an azure pool shaded by palm trees, an infinity with unincumbered views of the sea, or a swanky rooftop lap pool overlooking city, there are few things that can revitalise and lift your spirits on these hot summer days like a dip in one of the beautiful, temperature controlled pools housed in Muscat’s picturesque hotels. Of course, you have to be an in-house guest to enjoy these glorious pools. Or you can opt to become a member of the hotels’ health clubs to gain access. Many properties in Muscat now offer monthly or annual memberships that provide access to their pools, gyms, and various other recreational amenities. For many, the prices charged are well worth it for access to world-class facilities in which to take advantage of the cooling fun and health benefits of swimming. At the Chedi Muscat, the chic 5-star beach resort in Al Ghubra, guests can choose between three pools: the adult-only Chedi Pool, an infinity pool surrounded by cabanas with a superb seafront location; the Long Pool, the lengthiest in the region at 103-metre (also for adults only); and the family-friendly Serai Pool, set with black mosaics and covered by an elegant canopy. “Our pools are temperature controlled. So the guests can enjoy these pools throughout the day. We also offer annual Health Club memberships for access to pools which are priced at OMR1,900 per person,” says Linda Silveira, the Sales Coordinator at the resort. Day passes and memberships are offered by many other luxury hotels in Muscat including The Crowne Plaza, where the day passes are priced at OMR10 for adults and OMR6 for children. The Grand Hyatt Muscat, which has one big pool for adults and one pool for kids, offers both memberships (1, 3 & 6 months and 1 year – now with a 20 per cent summer discount) and day passes priced at OMR10 for adults and OMR5 for children. The pools are open from 7am till 9pm in both the hotels. The Intercontinental Hotel, which has a leisure pool and a lap pool offers day passes to public at OMR15 for an adult and OMR10 for a child. They also offer 3-month, 6-month and one year memberships for individuals and families. Meanwhile, Al Bustan Palace Hotel has a ‘day use offer’ where an individual or family can check into a “relax room” and have access to all facilities including the swimming pools from 10am till 6pm (rates start at OMR70). Besides, these high end properties, various other hotels across the city including Majan Continental Hotel, the Al Falaj Hotel, and Ruwi Hotel offer pool memberships for more moderate prices, around OMR40 per month. Make the most of what’s left of the scorching summer heat by starting a healthy, new, cooling habit at one of Muscat’s premiere swimming pools. A newly launched video titled 12 days in Oman, shot by German filmmaker, Marko Roth and featuring the vast beauty of Oman over a period of 12 days, has got viewers going wild, sending the film viral on the internet. The video, which is just under four minutes long, was uploaded to Vimeo on the June 15 and had already clocked up more than 58,700 views at the time of going to print. Roth’s video features unexplored realms of natural beauty all the way from the north to the south of the Sultanate. The picturesque landscapes and eye-catching beaches, deserts, mountains and wadis captured on screen by Roth and his remarkable team of three has certainly struck a chord with Omani viewers. “We drove over 4,200 kilometres across the unexplored and beautiful country of Oman. We made friends with young and old Omanis, discovered absolutely stunning landscapes and captured our entire experience in this film,” Roth told the local media. Roth has covered every facet of Omani culture, from the famous local spices to hot Arab sands. Whether it is the beautiful mosques or the antique forts that dot the Sultanate’s landscape, 12 days in Oman has captured it all. The German filmmaker has received acclaim from the Ministry of Tourism as well as other institutions, with viewers leaving positive comments on the video in their droves. A key usufruct agreement on the $2.5-billion Omagine Project is expected to be inked on July 1, paving the way for the development of Oman’s latest waterfront tourism and real estate project, a report said. This follows the signing of a development agreement (DA) last year between the Omani government and developer Omagine, according to the Muscat Daily report. The DA, which allows the government and Omagine to enter into a usufruct agreement, was ratified by the Ministry of Finance in March of this year, the report stated. The Omagine Project will come up on one million sq m of beachfront land in Seeb, facing the Gulf of Oman just west of the capital Muscat and six miles from Muscat International Airport. The ambitious development will be designed, developed and operated by Omagine LLC, the US-based Omagine Inc’s Oman subsidiary. The signing of the DA and usufruct agreement, which will take place in Muscat, grants Omagine usufruct rights over land constituting the Omagine site, which includes the right to sell such land, said the report. The term of the usufruct agreement is 50 years (with five years free of rent) and the RO20,250 ($5,460) usufruct registration fee, which Omagine will pay the Ministry of Housing, is based on the 45-year term of the usufruct agreement on which rent is payable, the report added. The Omagine Project is planned to be an integration of cultural, heritage, entertainment and residential components including a high-culture theme park containing seven pearl-shaped buildings, each 60 ft in diameter. It will also include associated exhibition buildings, a boardwalk, an open-air amphitheatre and stage; open space green areas; a canal and an enclosed harbour and marina area; associated retail shops and restaurants, said the report. The development will also feature entertainment venues, boat slips, and docking facilities; a five-star resort hotel, a four-star resort hotel and possibly a three or four-star hotel; commercial office buildings; shopping and retail establishments, and approximately 2,100 residences. Earlier this year, Omagine Inc said the construction contract for the project was expected to be signed with Consolidated Contractors Company (CCC)-Oman by the end of this month. Omagine LLC is 60 per cent owned by Omagine Inc with Royal Court Affairs holding 25 per cent, and the remaining 15 per cent owned by two subsidiaries of Consolidated Contractors International Company. The Wave, Muscat, a premier mixed-use community project, has sealed an agreement with Bank Muscat for the sale of 230 residential apartments in 4 blocks at its ‘Marsa Parklands’ development to the Omani lender. The deal for the units located between the marina and new Kempinski, The Wave, Muscat Hotel was finalised for RO30 million ($78 million), reported the Oman Observer. The Omani developer also inked an agreement to develop a mixed portfolio of real estate assets for a new property fund to be managed by the bank involving investments of up to RO 75 million. Bank Muscat has purchased the 230 units in the first tranche of a number of transactions planned at The Wave, Muscat and the largest off plan real estate purchase in Oman in the last 12 months, the report added. “The deal marks an important milestone in the development of the Omani real estate sector. The MoU aims to strengthen institutional participation in commercially sound and sustainable real estate projects,” AbdulRazaq Ali Issa, the CEO of Bank Muscat, was quoted as saying. “The Fund’s first purchase of Marsa Parklands is consistent with the bank’s strategy to offer investors a chance to participate in a relatively steady low risk investment with a healthy cash return over the long term,” he added. The Wave, Muscat CEO Hawazen Esber said the transaction with the country’s largest bank was an obvious step in capturing the increasing institutional investor interest in Oman’s property market and specifically to introduce new development opportunities to investors at The Wave, Muscat. “Institutional investors are becoming more discerning in the type of assets and locations they are prepared to invest in and there has been a lot of interest for emerging opportunities,” he added. The Wave, Muscat, an up-market residential development on the outskirts of Oman’s capital, has announced the launch of a project to build a further 99 villas. “Reehan Residences” precinct will offer five distinctive new designs and introduce a courtyard home. “Phase one of the new villa project will be launched later on Monday, comp¬rising 50% of the new villa precinct, with sales expected to close within a month,” said David Stafford, vice president of sales and marketing, addressing a press conference at the sales centre of The Wave, Muscat. Speaking to Muscat Daily, Stafford added: “Construction is expected to commence soon after and be completed within 12 to 18 months of the signing of contracts.” The project will include 31 five-bedroom villas of traditional design, 23 five-bedroom villas of contemporary design and 45 three-bedroom courtyard homes. The launch of the project was brought forward due to market demand, according to Hawazen Esber, chief executive officer of The Wave, Muscat. “We have accelerated plans for this next release based on the early sell-out of the last villa release, Reehan Gardens,” he said. Esber added that Reehan Residences’ design was influenced by requests from buyers for particular styles and features. “We have incorporated a number of new features that buyers have been asking us for, such as larger living areas, grander entries, premium bathrooms, a variety of modern and traditional facades and com¬munity facilities. We expect this release to be quite popular,” he said. 1. Because His Majesty Sultan Qaboos bin Said is a visionary leader. 2. Because Omani people are friendly. 3. Because Oman is clean and beautiful. 4. Because Oman is peaceful and safe. 5. Because Oman is known for its religious tolerance. 6. Because Oman has a good education system. 7. Because Oman’s law is equal for all. 8. Because Oman’s heritage and tradition are rich. 9. Because women’s safety is a priority in Oman. 10. Because Oman has the most beautiful beaches. 11. Because Sultan Qaboos Grand Mosque teaches you the meaning of being faithful. 12. Because the beauty of Royal Opera House Muscat leaves you breathless. 13. Because Oman is the land of Frankincense, Gold & Arabian Nights. 14. Because Oman’s wadis are hidden gems in the desert. 15. Because Oman has the most beautiful deserts. 16. Because Oman has the best road networks. 17. Because Oman has some of the best shopping malls. 18. Because Muscat Festival offers festive experience. 19. Because Oman has beautiful mosques. 20. Because Salalah is a perfect holiday destination. Five million tourists are expected to visit the Sultanate of Oman per year by 2030, a senior official from the Ministry of Tourism said on Monday. Speaking exclusively to the Times of Oman, Maitha Al Mahrouqi, undersecretary, Ministry of Tourism, said that Oman will attract 1.5 million more tourists in the next five years. “By 2030, we expect the number to go up by five million,” she said, on the sidelines of the Arabian Travel Market which began yesterday at the Dubai International Convention and Exhibition Centre in the United Arab Emirates (UAE). Around 2.1 million tourists visited the Sultanate last year. The Arabian Travel Market kicked off yesterday, providing business opportunities to entrepreneurs. The four-day event will also have seminars and ministerial discussions. With more than 400 confirmed exhibitors, the 2015 edition is set to welcome around 23,000 visitors. The show has grown in size and an extra hall has been added this year to accommodate 86 countries, 64 national pavilions, and 113 new exhibitors. From Oman, more than 26 companies, including a range of Omani hotels, are sharing the space with Oman Tourism, according to Maitha Al Mahrouqi. These include Al Bustan Palace, Six Senses Zighy Bay, IHG Oman and The Chedi Muscat apart from Atana Hotels, Radisson Blu Hotels & Resorts, Ibis Hotel and Park Inn by Radisson. Millennium Resort Mussanah is also present at the event. Next to the Oman Tourism enclosure is a big Oman Air pavilion which is drawing huge crowds. “Despite some problems in the region, the Oman tourism sector is witnessing strong growth and will continue to grow because of strong government policies,” she told the Times of Oman. She hoped that the tourism sector would continue to grow given the raft of projects in the pipeline and the rapid development of Oman’s aviation sector, with Oman Air expanding its network all over the Asia. Besides that, the opening of new hotels and airports is also contributing to the growth,” she said. Regarding the participation at Arabian Travel Market, she said that Oman will aim for more tourists from its neighbouring GCC countries. “We intend to strengthen and solidify our presence even more in the regional market through our participation in this very important event,” added Al Mahrouqi. “During the four-day exhibition, we will feature the natural beauty and diversity of our country, our main tourist destinations, major tourism projects, and other activities designed to provide holiday makers with the most memorable experience. Our neighbours in the GCC have always been an important market for us as we continuously witness a steady increase in regional tourist arrivals year-on-year. We hope to attract more tourists regionally and globally in our bid to become one of the world’s top-of-the-mind destinations,” she added.